Following on from our blog about the flow cytometry market which highlighted BD Bioscience as a key player, and focused on the success of the company’s FACS Calibur flow cytometer, today we’re going to delve a little deeper into our data for these instruments and see how other machines are performing in the market. To produce this insight, CiteAb product manager Rebecca Sadler has been looking at over 70,000 citations for flow cytometer use from 2013 to 2017. Rebecca said: “We already know that BD Bioscience claim the lion’s share of the flow cytometry instrument market, with its FACS Calibur machine achieving 90 per cent of all flow cytometer citations back between 1997 and 2005. The global number two supplier of flow cytometry machines is Beckman Coulter, a subsidiary company of Danaher. The company has seen a gradual increase in its claim of the market over the past five years, although this hasn’t been consistent across its product range. 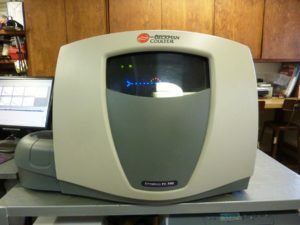 By far the most popular machine from Beckman Coulter is the Cytomics FC500 Flow Cytometer, which was first cited in 2003. However the FC500 has started to see a very gradual decrease in its citations, whereas other machines from the company are seeing increases. Other instruments from the Beckman Coulter range which are increasing the company’s market share are the MoFlo XDP Sorter and the Navios Flow Cytometer. Both BD Bioscience and Beckman Coulter should be keeping an eye on the activity of Millipore – the company is just beginning to show strength in the market with its Guava easyCyte and ImageStreamX Mark II, both of which increased in citations over the past five years. Finally, flow cytometer suppliers will ignore Miltenyi at their peril. The company is starting to show strength with its MACSQuant VYB machine, which our data demonstrates to have increased in citation count and share year on year. Today we’re giving away the data for the citation share between 2013 and 2017 for each of the instruments mentioned in this blog post for free. To receive your copy direct to your inbox, sign up using the form below. To find out more about our full range of instrument data sets, [contact Rebecca] who will be more than happy to help you.